Back to the American southwest - if only! 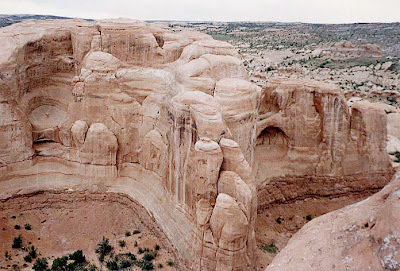 As promised, it's back to geology today and in particular, to the state of Utah in the American southwest. 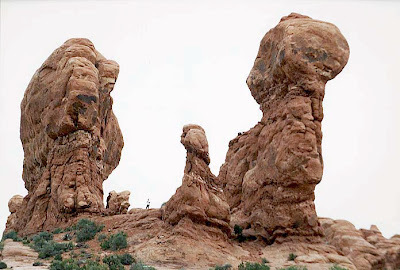 While my family and I were captivated by Arizona during our visit, the next state north from there, Utah is home to some truly stunning scenery and geological marvels as John Crossley's web site highlights. 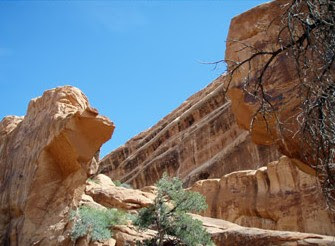 Dominated by Entrada sandstone, this area has been beautifully sculpted by nature to form over one thousand arches of this layered red sandstone. While many are tiny cavities as small as three feet across, there are others that span huge distances. 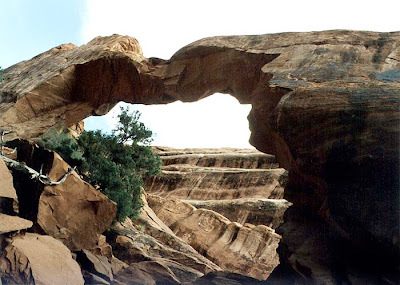 The largest arch is called 'Landscape Arch' which spans a massive 89 metres. 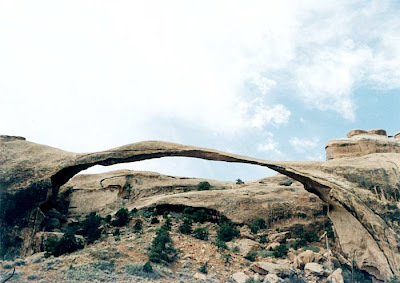 It seems I need to make that trip back to USA fairly soon as this magnificent arch is unlikey to survive much longer. Much of it's length is less than a metre thick and already has several serious fractures. The area surrounding it is now closed and it is awful to think that someday fairly soon it will come crashing to the floor, leaving just a pile of broken rock! Such collapses are not uncommon as on about 3rd August 2008, one of the most famous and most photographed features in the park, 'Wall Arch' collapsed. No-one witnessed it's dramatic demise, but that is geology for you! A formation which to you and I may seem beautiful at this moment in time is merely a small step in the geological process of erosion back down to individual particles again, ready to be deposited elsewhere to begin the whole process all over. So perhaps we need to enjoy spectacular features like these while they are here and not take them entirely for granted! 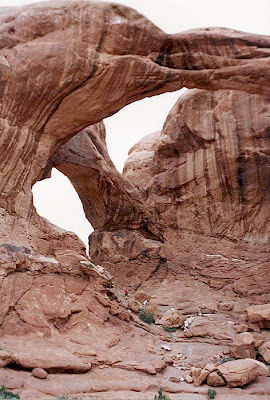 Double Arch, the Windows section, arches National Park, Utah. 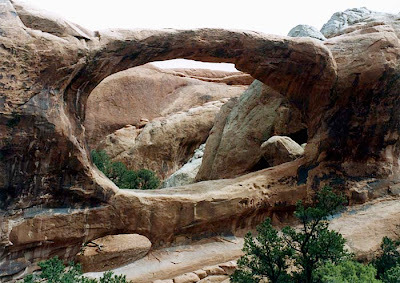 Some features are more 'tunnel' than 'arch', such as this formation, aptly named 'Tunnel Arch'! Rock formations in the windows section, possibly the surviving remnants of previous arches? A small canyon, near Delicate Arch, Arches National Park, Utah. So how did the Arches form? Okay, around 300 million years ago the Colorado Plateau area as Ron Blakey's paleogeographical maps will show you, was ocean. With the passage of time and a great deal of evaporation, a huge salt bed was left behind. These salts were eventually overlain with sand sediments ultimately forming a sandstone layer over the salt bed. However, under pressure salt becomes unstable and the area became subject to distortion and buckling, forming domes and folds. Increasing pressure creates faulting which exposes the formations to the erosional effects of the elements, creating 'fins'. 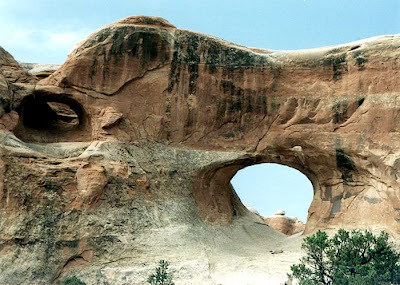 These in turn are eroded away such that in certain circumstances holes are created through them - the start of the formation of an 'arch'. Okay, that may be a fairly simplistic explanation of their formation, but it at least gives you an idea. Fascinating though, don't you think? 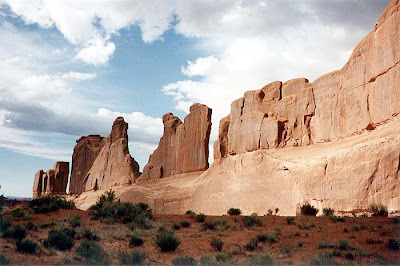 Just google 'Arches National Park Geology' if you want more details! Now, any fellow English persons looking in may well be wondering quite what I have against the geology of good ol' Great Britain! Well, the answer is absolutely nothing and this is something I will start to rectify in future posts! It's 18th September at last! So what, I hear you cry! Well, today is the day that the Open University, S104 - Exploring Science course website opens 'for business' and that business is the quest for 'knowledge'! I've had brief look at the site already and it all makes everything seem more real if you know what I mean. After months of build up it's really here and I need to get myself organised, pronto! There are no details of my course tutor as yet - I think these details will be given early next week. Poor guy (or gal? ), I'm sure he/she will be enjoying his/her last week of peace before his spare time is forever interrupted by the likes of little ol' me asking increasingly stupid questions over the next nine months! So the long road to what will hopefully be a degree in Geoloogy starts here! By gum, it's exciting and I have to say a little bit scary, but I've already made a tentative start on the course work and it's a fairly gentle start with a look at Global Warming as I mentioned last week. This weekend I will have a crack at the first 'task' which is to design and make a couple of rain gauges to measure precipitation over a 2 week period. One gauge is to be open topped and the other to have a funnelled top. The former will show the effect of evaporation you see, while the funnel topped one will minimise it! So, this will take me back to my 'Blue Peter' days of making stuff with washing-up bottles and sticky tape! I'm sure I will get some cracking data here in the soggy north-west of England where it's done nowt but chuck it down all summer! Sod's Law dictates of course that we will now suffer the driest October 'since records began', but as the course book says, zero rainfall provides just as valuable data as a fortnight's daily downpours! Once Alyn's rain gauges are up and running I might just photograph them and post a pic on my next blog for you to have a laugh at, or perhaps marvel at my ingenuity and dexterity!! I've also already had a sneak preview of the second course book which covers amongst other things, geology. Now that book looks like it's going to be great fun! We're supplied with a small kit of rock samples, fossil plaster casts, what looks possibly like litmus paper, a hand lens for examining said samples. All exciting stuff! Now if I remember rightly, there's a test you do for a particular rock, limestone I think, that fizzes when vinegar is poured onto it. The acidic vinegar causes a chemical reaction with the calcium carbonate, I think, maybe?? Please don't laugh! I've probably got that hopelessly wrong, but hey, I've only just started! Gimme a break! One thing I've noticed myself doing already is thinking critically, an essential skill in academic work I do believe. Global warming for example is a subject that creates a huge amount of debate, not least at my mothers dinner table on a Saturday night! I have long argued that it is the long term trends that are relevant, not one hot summer. After only working through a few chapters of book one, I am already wondering over what length of time does one need to judge such things for the true picture to be formed? Hmmm!?! Let me finish book one and I'll tell you more! Greetings from Wayne and 'Grumpychops' Unmasked. And there I was thinking no-one actually reads this stuff! This blog started out quite innocently, as a simple outlet for whatever I feel the need to write about. While I have tried to write as if to an audience of millions, I presumed that realistically only the occasional 'e-wanderer' would actually stumble on this venue and even less actually find it's contents worth commenting on! By September 5th 2008, I had received two comments on my blog: the first from my step-daughter and a second from someone who shares my love of rocks and rocky places which were nice to receive. However, the third comment arrived in the early hours of Saturday morning UK time and left me shocked, humbled and inspired in equal measure! On Saturday morning my wife alerted me to a new comment on the blog and urged me to quickly go and have a look at it as she thought I'd be quite excited by it! Hmmm!?! Intriguing! It was with some surprise that I saw the name 'Wayne Ranney' leap out of my monitor and smack me between the eyes! Now, for the uninitiated, Wayne is the author of the book 'Carving Grand Canyon', a book I've mentioned several times already on this blog. Not just 'a book about Grand Canyon', this book takes a look at the complex theories as to how Grand Canyon was formed and tries to unravel the mysteries surrounding it's formation. In short, a superb book! Now I can only presume that Wayne has simply searched to see who might have his book listed as one of their favourite books in their Blogger profiles and stumbled upon my 'humble blog' that way. What a small world we now live in eh? Little old me, waffling on about a geology book and then the author, thousands of miles away, visits my blog and leaves a message. It made my day, I must say and you can read Wayne's comments by clicking here. WOW! It's not just the fact that he visited my blog, but that he's actually read some of it! "thanks for all your fine writing" he said! Crikey! What more can I add except to repeat my reply to his message. Thanks again Wayne for your kind words. I am now inspired to take my 'humble blog' a lot more seriously and concentrate on the geology theme for the majority of the time. The 'moans and groans' that were the spur to start this blog will be confined to the past! What did strike me as a bit daft though was the realisation that Wayne Ranney was writing a message to 'Grumpy Chops'! So, maybe it's time to lose my anonymity, at least partially and make this blog a bit more personal and friendly? So with that aim in mind, say a big 'Hello' to . . . . There! That wasn't so bad was it? Much more open and approachable than 'Grumpychops' is it not? 'Alyn' is a welsh spelling, courtesy of my welsh mother and has been both a blessing and a curse over the years. I've lost count of the multitude of different (incorrect) spellings of my name that i have been subjected to! Alan, Allan, Allen, Alain, Alun, Alwyn . . . . The list goes on, but Alyn is the name and the one you'll see on this blog from now on! So that's it for now. Next time we'll be back to geology! Promise! 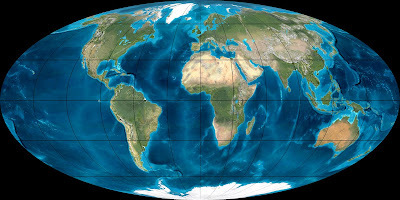 The Earth as it is today. A while ago I included a link on the blog to Ron Blakey's web site. This includes amongst other great stuff, a series of fascinating maps of the world as it looked at significant points in time. These illustrate superbly the concept of plate tectonics and the drift of continents over huge spans of time. Today I've added a small slideshow of this series of maps towards the bottom of the right hand column. 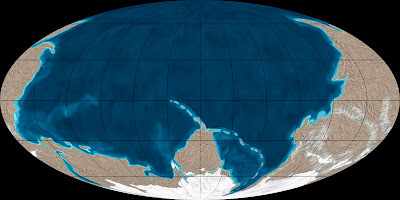 While being a bit small, it does show how the continents moved around the planet, going back in time from the present back to 600 million years ago and the Late Cambrian period. Clicking on any individual slide will take you to a full size image with a brief caption illustrating its place in geological time. It's always worth keeping in mind whenever one looks at a particular bed of rock that the environment in which it was laid down was very much different to its current situation. These superb representations certainly help me to grasp how environments change over time. It's amazing to think when looking at a certain geological feature that where you are standing was once ocean or was once subjected to a great out pouring of lava from a nearby volcano! Incidentally, a series Dr Blakey's images will feature in a soon to be published book written in collaboration with Wayne Ranney, author of 'Carving Grand Canyon' which I've mentioned several times. The new book is entitled 'Ancient Landscapes of the Colorado Plateau' and will shed some more light upon the complex story of how the Colorado plateau evolved over time and contributed to the formation of Grand Canyon. Geology eh? Don't ya just love it? The Earth some 600 million years ago! So which bit became Britain? Well only a bit! You see, last Friday a package arrived containing the first batch of study material for my Open University course, S104 - Exploring Science. I made the mistake of quickly flicking through 'Book 4' which covers chemistry! Blimey! There across the page I was confronted with pages of chemical formulae. You know the stuff: H2 SO4 - that kind of thing, except great, humungus, long ones. All of a sudden my 'O' level in chemistry seems light years ago. In fact it damn near IS light years ago - 32 to be accurate! It's quite shocking to realise, it was the spring of 1976 when I did my 'O' level in chemistry and managed a grade 'C'. In fact I remember my chemistry teacher trying to persuade me to go on to do an 'A' level in the subject, but I instead chose to do Maths which with the benefit of hindsight, was perhaps a mistake! Anyway, now that I've composed myself a little, I reckon I'm suffering from the same syndrome that other newly enrolled OU students suffer from - 'First Study Package Panic'. That great idea you had ages ago about studying something that really interests you is suddenly happening! It's here and it's starting in just over three weeks! Gulp! But hey, one only needs to follow the advice given on the Course Guide - read the guide first and prepare properly. Book 1 is obviously the better place to start and this covers a great topic to get things off and running - global warming! Now this is a subject that I love, not least bacause it always gets me arguing with my mum! She is convinced that there is no such thing as global warming, it's all happened before and is nothing to do with human activity. Well, that might be true in part. It has all happened before but I believe that it is the rate at which it is happening that is the problem and that surely has got a lot to do with human activity. So, once I've covered Book 1, I should be ready to take on my mother again in another heated debate on a Saturday evening over a bottle of Cabernet! Yep, after flicking through the course materials, there is a lot of exciting stuff ahead including home experiments and studying rock samples and fossil plaster casts, so I can't wait to get cracking. So keen am I that I've bought a new pencil case - a lovely 3 compartment one in 'mock Croc'. Oh yes, new course = new pencil case! It's only right and proper in my book! Sure there will be challenges ahead, not least actually finding the time to do the studying amongst the detritus of the everyday working life. Oh to ditch the day job and devote ALL my time to it, but alas, that wouldn't pay the bills. So, I'll see how I go and review my progress regularly. Meanwhile, if there are any other S104 enrollees looking in, do get in touch and we can share thoughts on the challenges ahead! Grand Canyon, Arizona - very hot! Due to global warming? Well, possibly, a bit, but what's certain is that this is the most pathetic excuse for showing ANOTHER photo of the wonderful Grand Canyon! !